The Urban Climate Change Adaptation and Resilience (UCCAR) training course, designed by USAID Adapt Asia-Pacific, aims to improve awareness and knowledge of climate change adaptation among mid- to senior-level urban managers and planners and, in turn, help them design better climate change adaptation projects that contribute to the adaptive growth of their cities. The UCCAR course is specifically designed for the growing second- and third-tier cities across the Asia-Pacific region. The material is meant to be customized for local delivery throughout the region, with features such as a “city profile” specific to the site of delivery. This publication highlights the key learnings from the course. This is the fifth publication in the USAID Adapt Asia-Pacific Adaptation Finance Knowledge Series. For related resources see the Further Resources section below. The six key learnings from the course are given below. See the full text for much more detail. More than ever before, people are moving to cities in hopes of nding economic opportunity for themselves and their families. Over half of the world’s population now lives in cities, with the urban percentage set to surge to 70% by 2050 globally – or 6.5 billion people. With over one billion city-dwellers in the Asia-Pacific region, building adaptive capacity and decreasing vulnerability to climate change in urban areas is increasingly important – particularly in many secondary Asian cities which have an ever-increasing population and where citizens lack access to basic infrastructure. While the challenges are considerable, much progress can be achieved by aligning the goals of urban planning and development with those of climate change adaptation and resilience-building. The concentration of people and ideas in cities makes them centers of economic and social development. In the Asia-Pacific region, cities represent the hopes and aspirations of their nations, while simultaneously serving as drivers of technology, innovation and growth. The same characteristics that make cities engines of growth and development, also make them particularly vulnerable to climate change. For example, the ever-increasing supply of human resources in cities creates a large pool of thinkers, workers and customers to drive economic growth. However, when population density increases rapidly, it stresses urban systems. Urban areas are aggregations of complex and interlinked systems and services that are dependent on multiple inputs and outputs. Impacts on one small aspect of this network can have cascading impacts across the whole city. Climate change is also mired in complexity. The manifestations of climate change in any one city are a function of global and regional climatic processes and local geographic characteristics. It is difficult to predict precisely how changes to the overall system will manifest in one particular area and to what degree people will be impacted. Efforts to mitigate global warming involve similar activities all over the world. Climate change adaptation, on the other hand, is inherently local, with actions varying significantly from place to place. Each city has a unique “threat profile” based on its physical location and an equally unique “vulnerability profile” based on location-specific socio-economic and political factors. Local communities have a great understanding of the specific vulnerabilities of people and assets in their area, and can provide detailed information about their specific adaptive capacities. Local governments need to be mindful that there are no pre-packaged solutions for adaptation; just as cities develop in their own unique ways, so do their climate change vulnerabilities. Cities are constantly changing and growing in response to economic and social pressures. Current urban management practices in Asia inhibit integrated and sustainable urban planning, and hinder cities from adequately adapting to climate change. Working in 'siloes' can also result in maladaptation, in which strategies designed to address climate vulnerability over the short term end up increasing vulnerability over the long term. When cities mainstream adaptation into an integrated model of adaptive and resilient urban growth, they can plan, build and continually evolve to anticipate and react to internal and external changes to the environment and society. As centers of economic growth and development, cities are also inherently centers of innovation, creativity, education, knowledge, and finance. Cities have significant untapped capacity to finance climate change adaptation and resilience-building activities, especially if these activities have co-benefits for other local development priorities. To effectively allocate resources for adaptation, city governments need to understand the landscape of climate finance and develop the skills to design and implement technically-sound, socially-inclusive and bankable climate change adaptation projects. 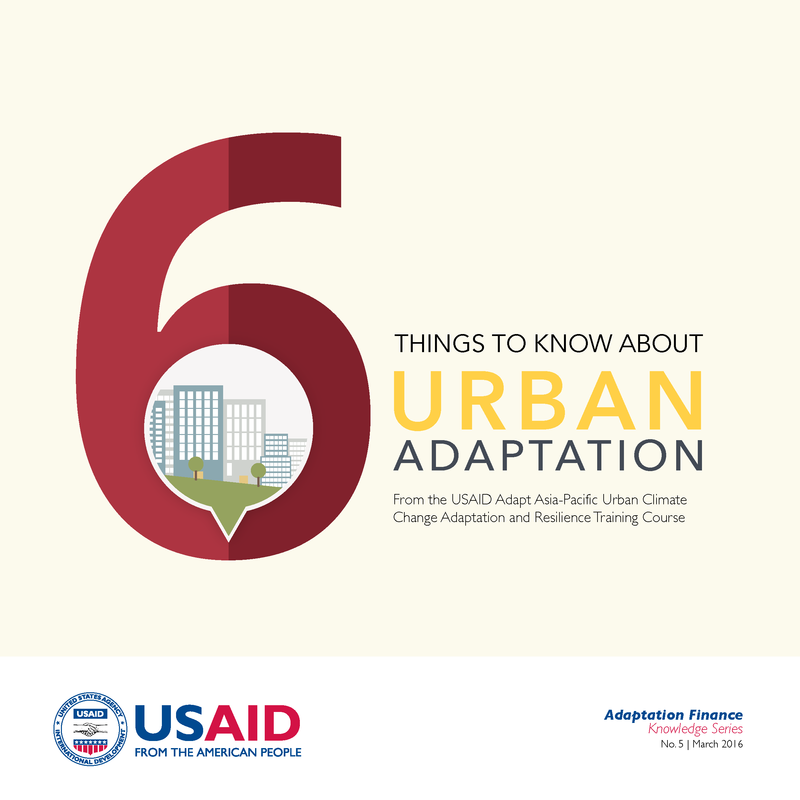 USAID Adapt Asia-Pacific (2016) 6 Things to Know about Urban Adaptation. USAID Regional Development Mission for Asia: Bangkok, Thailand.